Este jantar no Rio Sena ou almoço é uma maneira relaxante de ver os pontos de interesse de Paris, como a Torre Eiffel, Notre-Dame e o Louvre. Admire os pontos turísticos da orla e passe por pontes como a Pont Neuf enquanto saboreia uma refeição gourmet de 3 pratos, acompanhada de uma taça de champanhe ou meia garrafa de vinho francês. 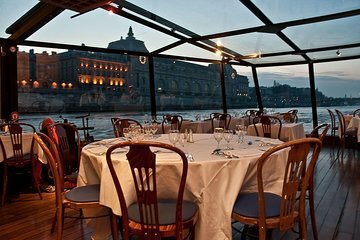 Desfrute de cozinha requintada e bom serviço a bordo de um barco com box de vidro La Marina de Paris. O jantar noturno inclui meia garrafa por pessoa, música e o show de luzes da Torre Eiffel. Pacotes de romance com pétalas de rosa, janela de estar e fotos de lembrança estão disponíveis. Selecione um cruzeiro à noite no almoço, no início da noite ou no rio Sena durante a reserva. Em seguida, encontre-se ao pé do Musée d'Orsay, no centro de Paris, para embarcar no seu barco La Marina de Paris, um navio com paredes de vidro que oferece vistas panorâmicas das atrações à beira-mar de Paris. Ao deslizar vagarosamente pelo Sena, absorva a beleza de Paris de uma perspectiva diferente. Capture vistas de museus parisienses e monumentos impressionantes como a Torre Eiffel, Notre-Dame e o Louvre. Flutue sob pontes magníficas como Pont Neuf e admire a cidade durante o dia, pois as luzes da cidade começam a brilhar no crepúsculo, ou iluminadas de forma brilhante depois de escurecer. Saboreie uma refeição sofisticada de 3 pratos, a escolha do prato principal e uma seleção de sobremesas deliciosas. As opções variam de um cruzeiro de almoço de duas horas ou de um cruzeiro de jantar de fim de noite de 75 minutos para aqueles em um horário mais apertado, cada um acompanhado por uma taça de champanhe e uma taça de vinho. O cruzeiro noturno de 2 horas inclui uma meia garrafa de champanhe e meia garrafa de vinho por pessoa, acompanhada de um menu da mais robusta seleção de pratos franceses gourmet. Jantar noturno é acompanhado por música para melhorar a atmosfera aconchegante, e para o grand finale, você verá o show de luzes da Torre Eiffel. What a perfect way to see Paris by night! All tables were in the windows as all parties were couples. The best thing we did in Paris. Please ignore some of the poor write ups on here, they must have been in a bad mood! We had the most wonderful time, lovely food and lovely service. 100% must do activity in Paris. nous avons passé un super moment en famille, avec un personnel charmant et très serviable. le repas était bon et servit tranquillement, nous permettant ainsi d'apprécier chaque plat et la vue. Petite ballade tranquille que nous retenterons de nuit pour profiter des lumières de paris. Everything was in a hurry. Food was cold, wine was bad. Dinner table was small and very cramp. Views were not so fantastic after all. I was very nice experience. Something not usual... It was very romantic. The food was good. The staff very friendly. I would recommend everyone take a trip down the Siene. The views are fabulous, but maybe with a different tour. I was extremely disappointed in the food served.Plus we were charged an additional amount at the end. Beware that if you ask for a glass of water, you are charged, if you choose the beef option, you are charged, and if you say yes when they ask if you would like more wine...yep you get charged. I don't mind if they are upfront about extra charges, but this all came as a surprise when we received a bill at the end. Plus I believe the tour cost should cover a glass of water. This dinner cruise was great for seeing Paris at night! Everyone had views of the window and for the most part you could still have an intimate dinner with your significant other. I recommend it for that reason. The food was ok. It was a taste of delicacies and some needed to be seasoned main course. Dessert was great! The part I will say was good for us was that we are not drinkers. We told our waiter and he immediately removed the alcohol and got us whatever we wanted to replace the wine. Thank you for that! Overall we had a great time on the water. Dreaming of riding down the Riviera with a loved one as you are serenaded by beautiful music? This is the cruise for you! We enjoyed the enchanting allure of Paris' lights, the bells of Notre Dame chimed as we passed, the Eiffel Tower loomed in it's golden glory all while dining on a five star meal. Highly recommend if you're looking for an amazing picture taking opportunity or if you're just looking to enjoy the City of Lights in style.